Yesterday Hannah wore her Thomas shirt to school. The one I purchased at Walmart. In the boy's section. (The girl's section had no Thomas). Since she's a preschooler now, I couldn't help but wonder if other kids would notice that she was wearing a boy's shirt. Some of the kids she's with now are 4 years old. When you're only 2.5 you don't notice much of fashion (OK, my kid doesn't). She just notices the characters or colours. She doesn't care what section it was purchased from or who it was "intended" for. And obviously, since I made the decision to purchase it, deep down I don't care either. Thomas is a non-offensive show that she enjoys. There are two Thomas backpacks in her new coat room - guess what she shows me every day? But a part of me couldn't help but wonder if the older kids would pick up on it. Would they think she's cool for liking Thomas? Would they question her as to why she's wearing a boy's shirt? It brought me back to high school. I was obsessed (kind term) with the Backstreet Boys. I still kind of am. But I liked them back before it was cool to like them (circa 1996 when everyone hated them because rock music was popular and "clearly" they were just trying to be New Kids on the Block). And I still got a BSB shirt. And a BSB hat. And I wore both to school on a regular basis (had to do my part to Keep the Backstreet Pride Alive!). At first, I would get made fun of. But I really didn't care. The Backstreet Boys made me happy, and in turn, wearing their merchandise made me happy too. Once people began to notice I was STILL wearing the shirt and could care less what they thought, I'd like to think in some weird way I gained their respect (not that I was after it) or they just saw their teasing was pointless, and moved on to someone who's skin they could actually get under. I liked wearing my shirt with A.J., Brian, Nick, Howie and Kevin's face on it so much I continued to wear it until it got holes. (I have others I now wear as pyjamas, and one in rotation in my closet from their tour in 2013). So, if Hannah wants to be like me and wear what she wants (as long as it's appropriate for preschool, which a tee shirt is) that makes me proud. As you can see from the photo above (where she is wearing said shirt), Thomas makes her as happy as the Backstreet Boys make me. Obviously I wasn't with her at preschool all day, but soon after we got there a little girl gave her a big hello hug in the coat room. And when we got to the Preschool room, her friend M, in a flowing dress, ran right over so they could play bunnies together. 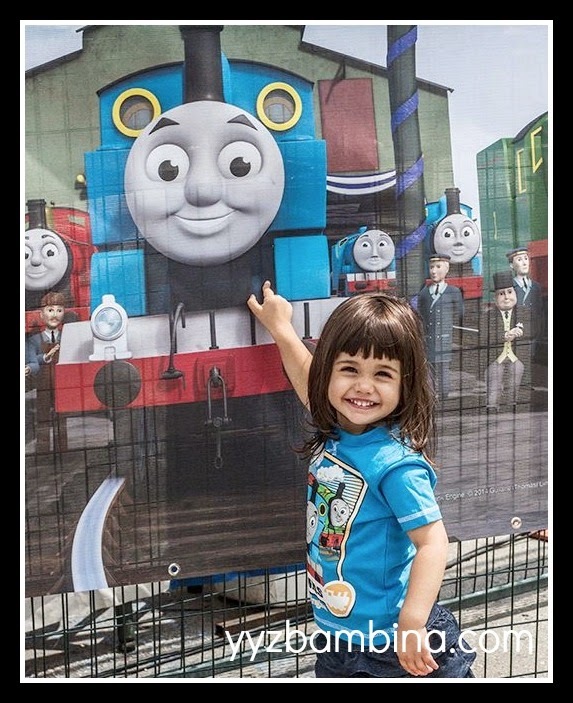 Besides a scrapped knee she gained on the playground, Hannah came home unscathed - and I had to take notice that her Thomas shirt was much cleaner than her clothes usually are at the end of the day. I hope Hannah's generation will truly be the one who bases their opinions on someone's personality - not the colour of their skin, who they love or what they decide to wear.